Maybe I better explain this blogs title before I go to far! Faux is probably familiar enough as a word meaning false or phony. Here’s a link to the definition of sgraffito and it’s used in several art forms, especially painting and pottery. 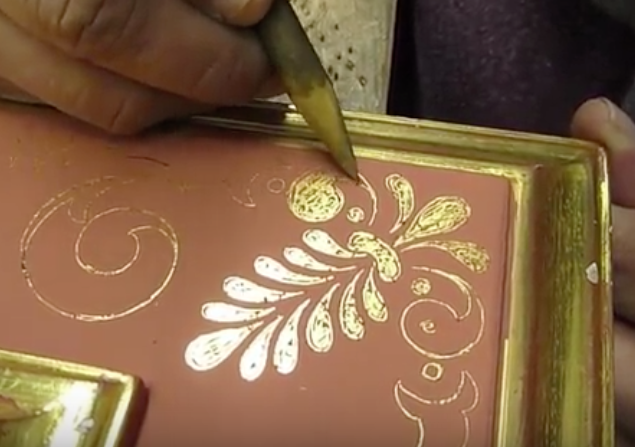 For picture frames the design is scratched onto the frame after it’s been painted over the gold leafed surface. Here’s a screen grab from a video by CJ Frames that illustrates that. This can be done free-hand or with the use of stencils. I really like effect but since my hands aren’t all that steady or artistic decided to try and come up with a different way of achieving a similar effect. Here are the results, I’m happy with how the design is faintly there, you have to discover it. Also the age and patina makes it seem as if the frame has been around for many years. The frame used is one that was made the same time I created the frame for Diane’s picture titled La Nina Mariachi . 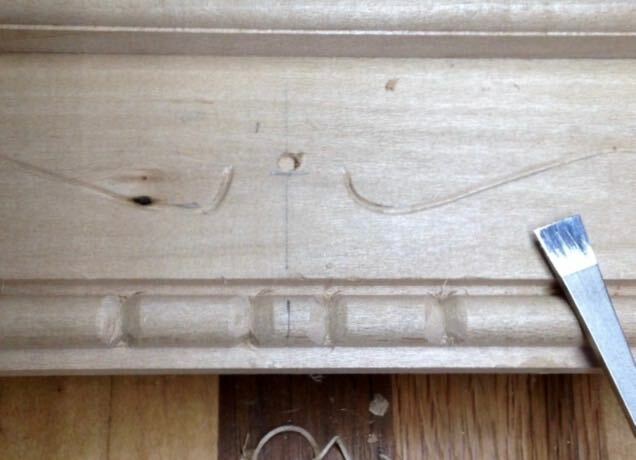 Here’s a link to the Blog Post about how the frame was constructed. The frame for Diane was made out of Tropical Walnut and since the machines were set up to cut the profiles and I had some Basswood available in the shop I choose to make two, additional 12″ x 16″ frames. Knowing this would be difficult to carve due to the profile the design needed to be kept simple; that’s when the sgraffito inspiration hit me. Searching through web images yielded a design I thought would work. By experimenting with the size I decided two different sizes were needed to make a pleasing layout and the best tool to get there was this long bent V-tool, 6mm. Keeping focused on the size of the piece curling out from the tool is what I used to gauge the depth of the cut. Once the designs were carved in, small circles were cut to add to the flow of the over-all design. These were done with a #9/3mm gouge followed up with a flattened punch to smooth out the wood in the bottom of the circle. That’s a technique used on the Waterleaf Frame recently completed here in Scottsdale as well. Lastly, a few sausages were added to the sight edge for some additional design. The next challenge was how to lay the leaf and in the 90 degree corners of this frame. They start at the sight edge around the bead but the most challenging is the one where the panel meets the rim. I found that by tilting the frame towards me and using a piece of cardboard to very gently push the leaf into the corners I had success. Going in I knew there would probably be some faulting but decided to celebrate the patina and aging affect this could bring. Toning of the frame followed my usual procedure. First the brassiness is knocked down with 4/0 steel wool and some of the red clay sealer was exposed to replicate years of being handled. This is the first time using Titanium White Casein only as the toner for this frame. I find that the way it really cooled down the gold and got into the carving is pleasing. The name given to this toning process will be Iced Gold and since I have one more frame with this profile it’ll give me an opportunity to experiment with it some more. Toning is a constant unknown which is what sets one frame apart from the next. So many variables in the process but that’s the beauty of hand craftsmanship versus production products. This entry was posted in Uncategorized and tagged casein paints, CJ Frames, composition gold leaf, Diane Eugster painting, frame desing, picture frame carving, Sgraffito, Sgraffito picture frame, toning. Bookmark the permalink.